Mrs. Sullivan is a committed, caring, and invested educator and Boston students are reaping the benefits. Sullivan attended Indiana University Bloomington, where she studied Music Education as a euphonium player. “I play the euphonium. It’s part of the tuba family. I thought I would play the saxophone like Lisa Simpson, but I hated the reed in my mouth, so I chose the weirdest thing I could find,” said Sullivan. Sullivan teaches full band, exploratory, and brass/woodwind classes throughout the day at Boston Middle School. She also teaches the Boston Jazz and Lab bands and helps with the LPHS marching band. She has taught at a few other schools around Indiana, including Bellmont High School and John Young Middle School. 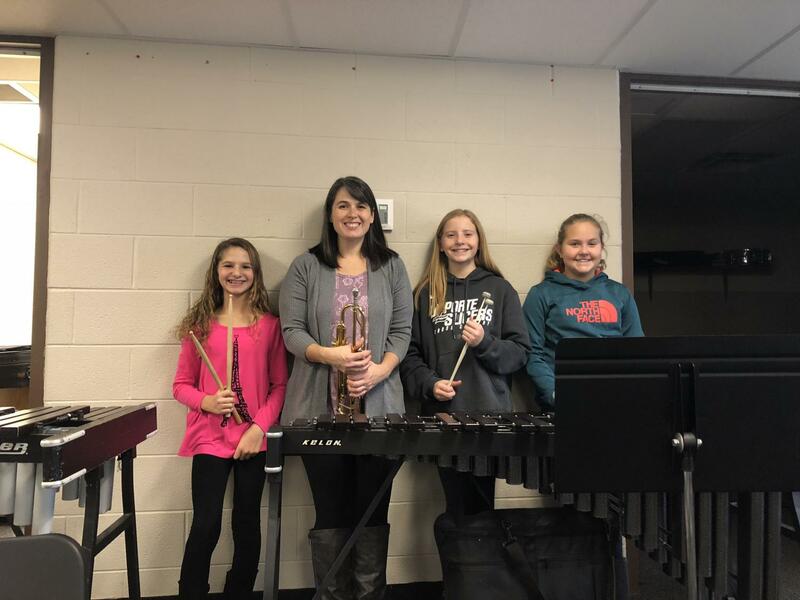 “I always wanted to be a teacher, but I felt that music was the best vehicle for me to teach students because it allows me the help kids with resiliency, cooperation, and dedication,” Sullivan said. One important concept that Sullivan tries to drive home with her students is the value of persistence as a musician. “I want students to know that they are only failures when they stop trying. Struggling is a good quality because it means you’re learning and growing,” Sullivan said. This is evident in her detailed, supportive approach to teaching. “There’s a lot of planning ahead [when teaching younger musicians]. I’m looking two to three months ahead so that students perform well on their concerts,” Sullivan said. Aside from that, however, Sullivan just enjoys music. “Music makes everything better. Have a good movie? Music makes it great. Have a big basketball game? Music makes it more exciting. Throwing a party? Add music to make it memorable. Sitting alone in a room? Music can transport you anywhere,” Sullivan said. In her free time, Sullivan still radiates creativity with some of her hobbies, such as knitting. “I enjoy making blankets, scarves, and hats. Sometimes my hats are inspired by famous paintings, other times they are less planned-out and created because I have that yarn available,” Sullivan said. Sullivan continues to follow and support her students, even after they have left her programs. “Students still surprise me with insightful questions and their own growth. I’m excited about their futures,” Sullivan said. Sullivan instills diligence and enthusiasm into all of her classes and inspires her students daily to strive to be better and endure challenges they face as she supports them along their journeys. She motivates her students to be both better musicians and humans with her unique and creative educational approach. She is a mentor and role model whose effect is far-reaching.